Friday August 26th 1898 I got through the morning work and Will and I went up to Stevens to a dinner party. We had a very pleasant time. I did some work at the hen house with Pinks help after I came home. Saturday August 27th 1898 I got Wills things ready and Charlie took him to town. Pink and I did a big washing and put in some corn to dry before noon. Will come back at noon. There had been a change in time and he could not get to Delavan tonight. I ironed in the afternoon while Pink did a lot of cleaning up around and after an early supper Levi took Will up to the night train and Pink and I went too. a bright moonlight night. Sunday August 28th 1898 Pink and I took a ride this morning and I left her at home. I got some dinner after I come home. I had different ones for company in the afternoon. I spent the evening down at Johns. Carl brought me home when he come from meeting. 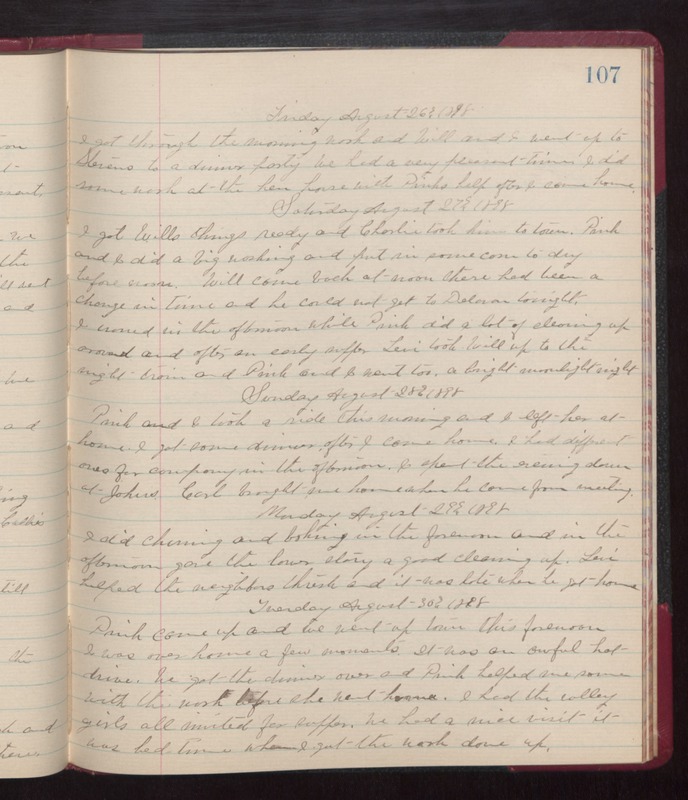 Monday August 29th 1898 I did churning and baking in the forenoon and in the afternoon gave the lower story a good cleaning up. Levi helped the neighbors thresh and it was late when he got home. Tuesday August 30th 1898 Pink came up and we went up town this forenoon. I was over home a few moments. It was an awful hot drive. We got the dinner over and Pink helped me some with the work before she went home. I had the valley girls all invited for supper. We had a nice visit. It was bed time when I got the work done up.